This page includes links to all of our decking DIY how to project tutorials including advice on treatment and general maintenance of decking and decked areas and how to build your own decking. Browse through the below list and click on your chosen link to view the project information. Decking - powerwashing decking - How to powerwash decking. Advice on the best way to powerwash a deck and on cleaning patios. Whether you are building or fitting plastic decking, composite decking, wooden decking or just a few decking boards nailed to a couple of timbers in order to get some good decking ideas it is an excellent time to click through to our decking pages to see how you can make the most of your garden decking. The decking design is as flexible as your mind! 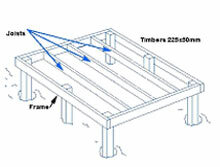 Timber decking can me built to accommodate any shape, you are only limited by your imagination. A decking calculator will help you work out the cost of your decking and whether it is cheaper to work with hardwood decking, a decking kit or larger decking panels. Sitting on a deck in the hot summer sun is a great way to spend a weekend and with our guides to fitting your decking it is not a difficult job. For greater effect you can build in some decking lights and go to our electrical section to see how to connect these safely. 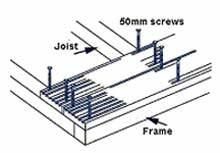 Special decking screws should be used and it’s important to use decking cleaner to stop the deck getting slippy. Non slip decking is a must for those lees sure on their feet and, combined with a non-slip decking paint you can be sure of not sliding off the end of your deck!